I (Chris) remember when I was seven or eight years old, the emblems and logos of cars were fascinating objects. 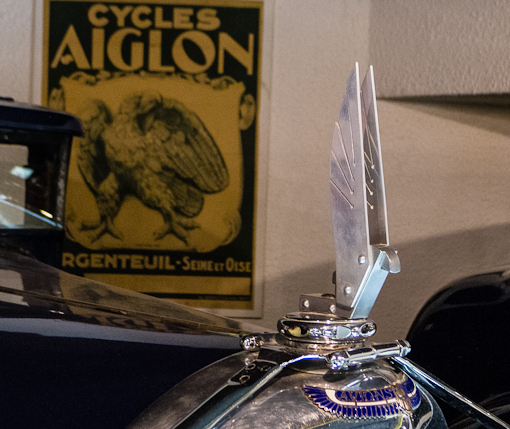 At the vintage car collection of the Fondation Pierre Gianadda, we saw a collection of car hood ornaments on the cars of yesteryears. 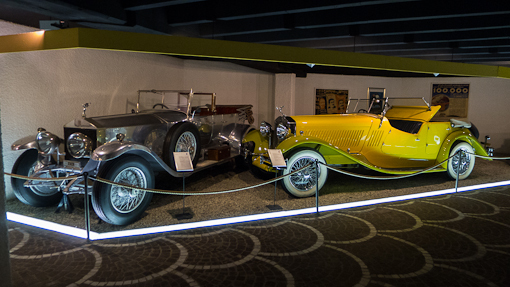 Starting with a silver Rolls Royce and a yellow Isotta-Fraschini 8A (from 1931). 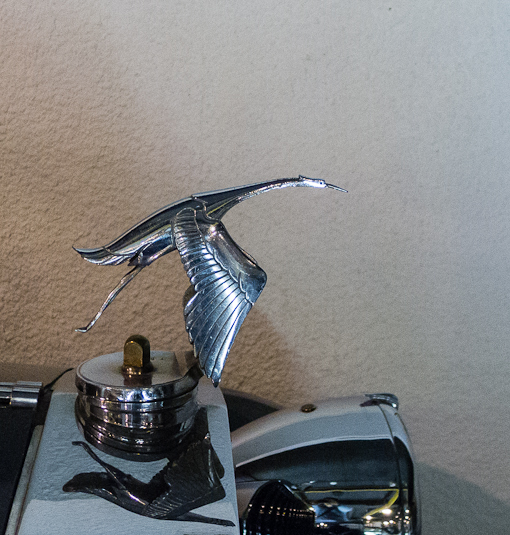 The most iconic hood ornament has to be Roll Royce’s Spirit of Ecstasy. 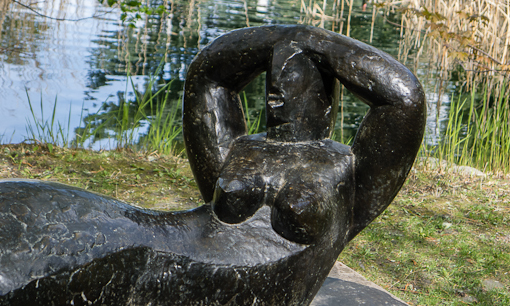 It is in the form of a woman leaning forward with her arms outstretched behind and above her with a cape billowing from her arms to her back, resembling wings (hence, it is also known as the Flying Lady). Supposedly, each piece is unique and a button on the dashboard retracts it inside the hood. See Wikipedia for more gossip about the lady. 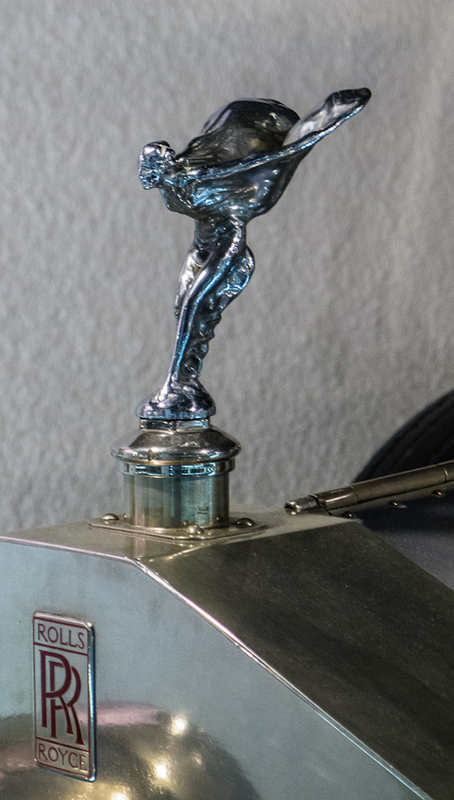 This piece of decorative metal figurine is also referred to generally as hood ornament, bonnet mascot, car mascot, radiator mascot. 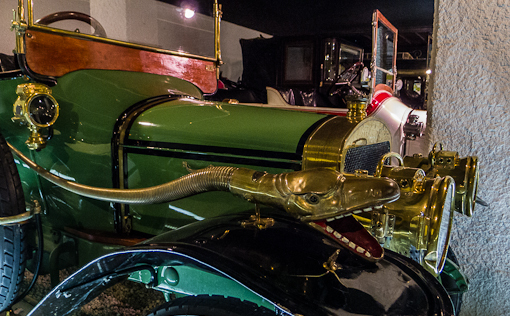 There are a lot of histories behind the ornaments, the brands and the car manufacturers, many of which are now defunct. Most designs tried to convey a sense of movement and speed – equating it to flight (hence, the wings). 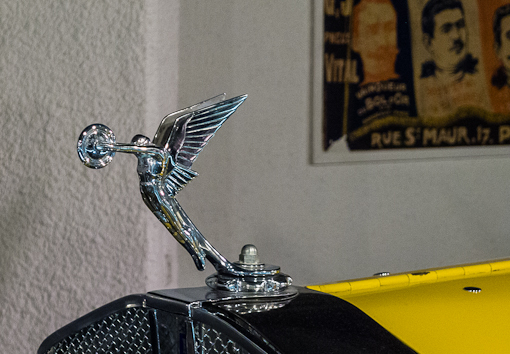 Avions Voisin, a French car maker who also made military planes during World War I, used a minimalist abstract winged animal (bird or horse) to represent the brand. 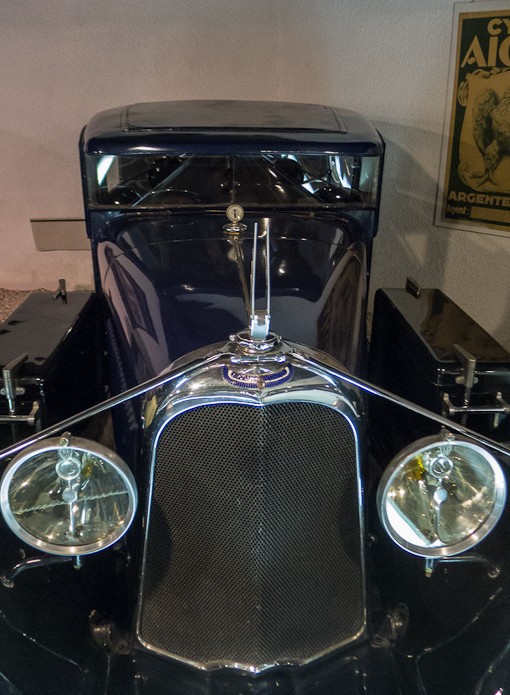 Front view of the Avions Voisin. 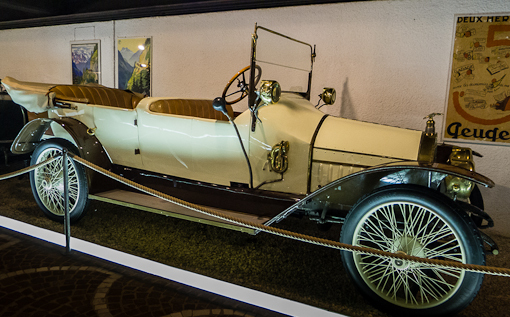 Hispano-Suiza – a Spanish brand which used a stork (?). 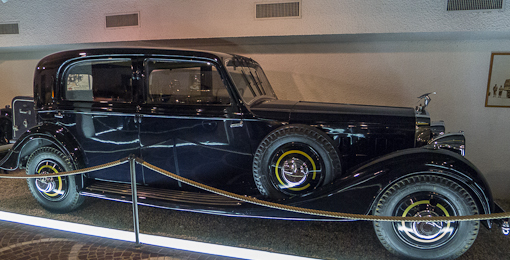 Side view of the Hispano-Suiza. I noticed the two designs below did not try to convey speed or movement. 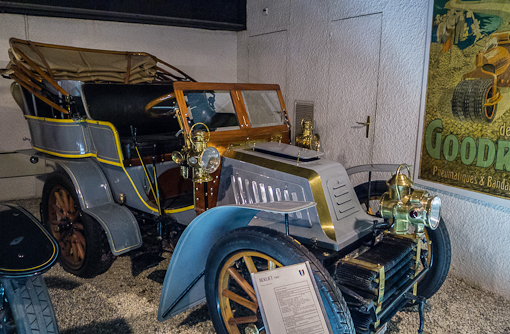 The first is a Bugatti from 1930 which carries a tiny elephant standing on its two hind legs raising its trunk (sorry about the size of the photo). 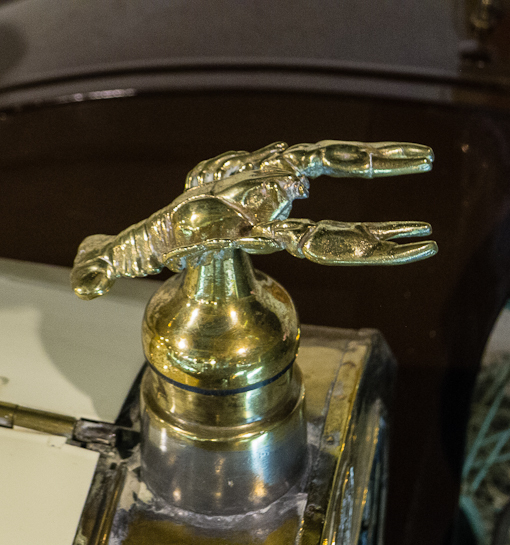 The second is this brass (or gold) lobster ornament (no, it is not a scorpion). 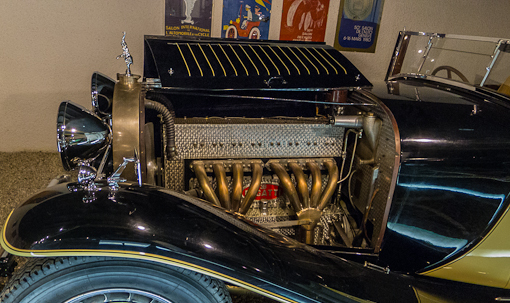 For the Bugatti elephant, although it did not suggest speed, it arguably conveyed power and mastery of movement. But what did a lobster represent ? 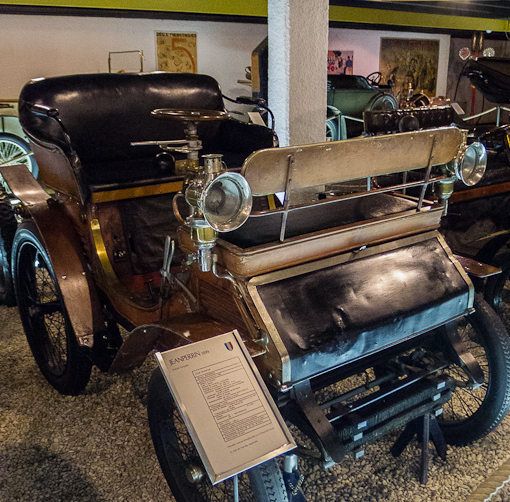 The lobster was installed on a car made by Velmorel from 1914. The emblem of this French brand did not include a lobster. 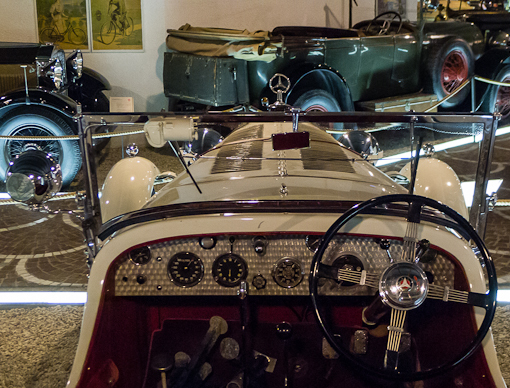 Nor were the cars manufactured near the sea – they were made in the Rhone-Alps region. Perhaps it was a personal ornament that the owner added to the car. 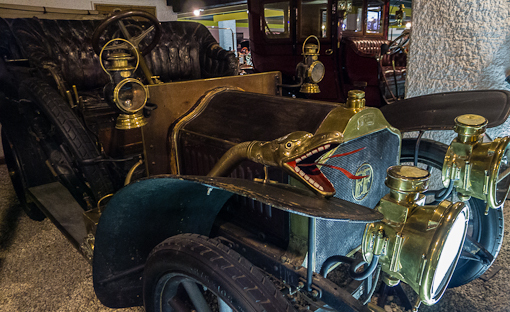 Then there are these angry hissing snakes that lurch from the side towards the front of the car. This is a Swiss-made 1911 Turicum. The brass snake on this white Turicum looked to me like a pneumatically-operated horn (see the black rubber bulb in the picture below). 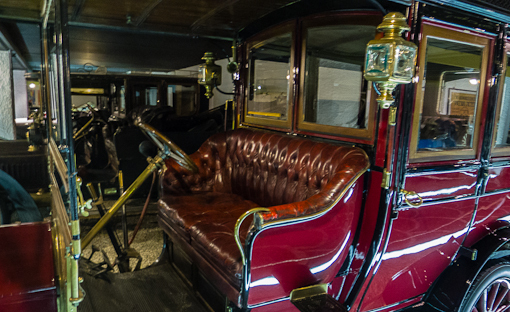 I can only imagine that the slow-moving pedestrians and horse-drawn carriages must have been such a nuisance to call for such an aggressive-looking, whimsical design ! 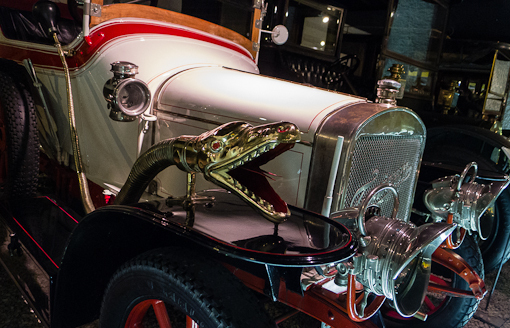 This snake design was also used by the PicPic brand (Piccard & Pictet) of cars from Switzerland. 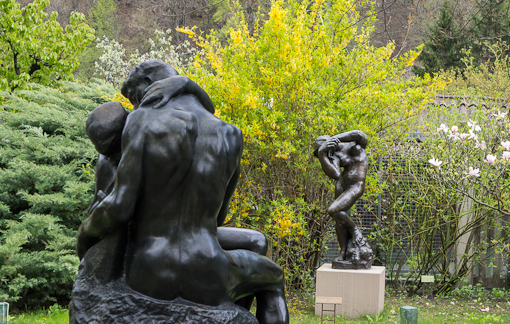 This one was made in 1906. Nowadays, I suspect hood ornaments are fast becoming a thing of the past except on some ultra-luxury models. Apparently in 2008, Mercedes-Benz stopped providing the erect three-prong star on the hood of its standard C-line of cars. 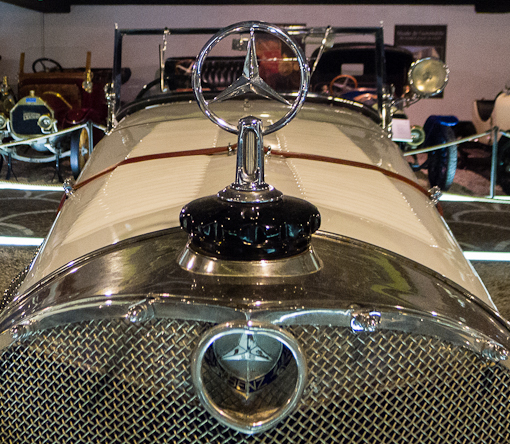 A feature of every Mercedes Benz made since 1923, fewer than 1/3 of their cars now carry the famous standing ornament. 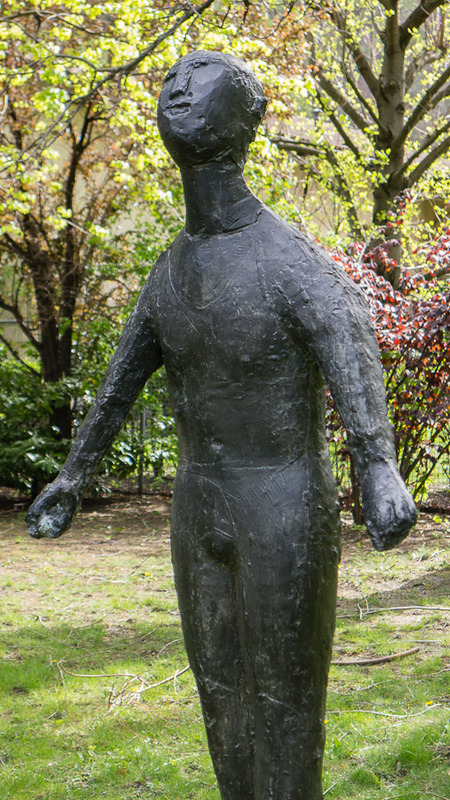 This one was made in 1929. I vaguely remember in the 80’s or 90’s when rappers start wearing these ornaments around their necks. The VW ornament seemed particularly popular at the time. 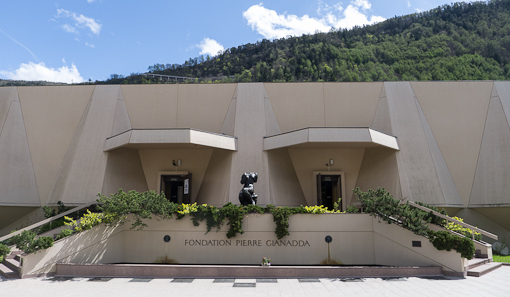 The Foundation Pierre Gianadda was founded by Léonard Gianadda in memory of his younger brother Pierre, who was killed in an airplane crash in 1976. 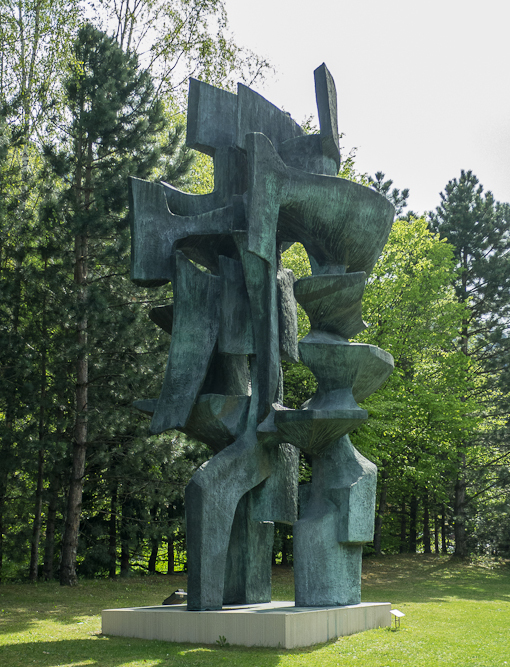 Apart from the adjoining sculpture park (posted here), the heart of the Foundation is a space for art exhibition and musical performances as well as a museum of automobiles which is located underground. 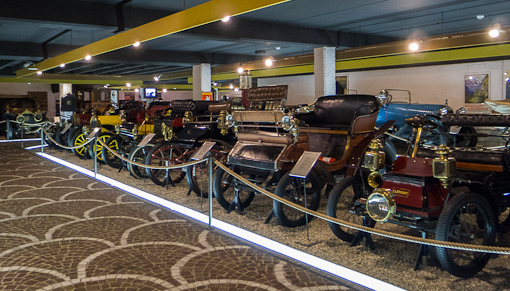 According to the museum, all the cars in the collection are in working order. 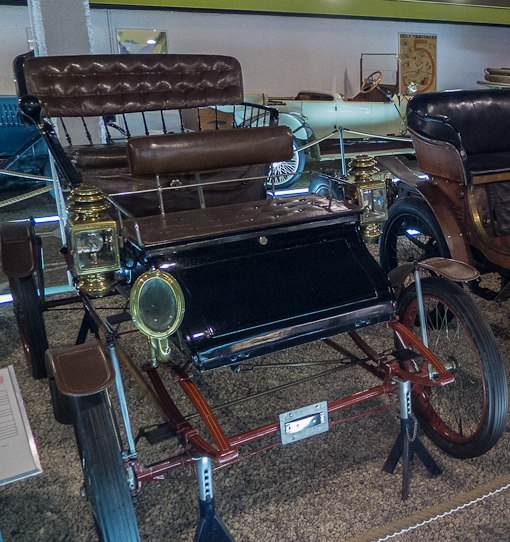 Here are some of the oldest cars in the museum. 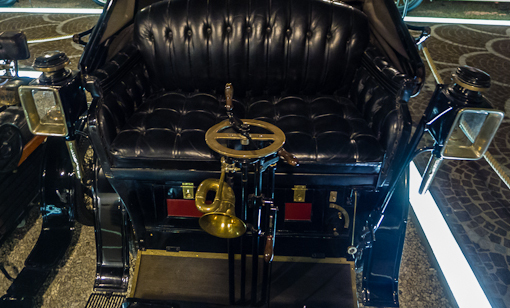 The steering wheel used to be a little metal ring in the middle. 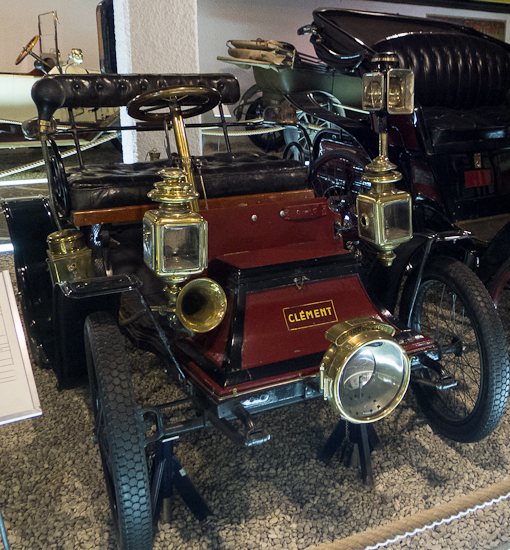 Benz 1897. 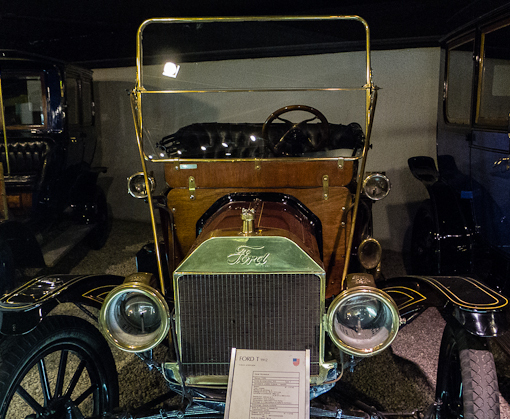 Ford Model T from 1912. 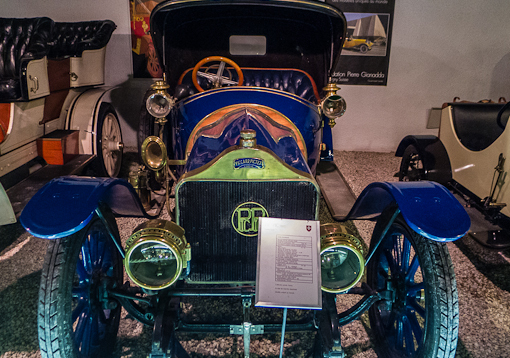 Pic-Pic (Piccard & Pictet) was a Swiss automobile manufactured in Geneva from 1906 to 1921. According to this Wikipedia entry in French, there are only 8 in existence and three are in this place. After a long dreary winter, our wait for a warm and sunny weekend is over. 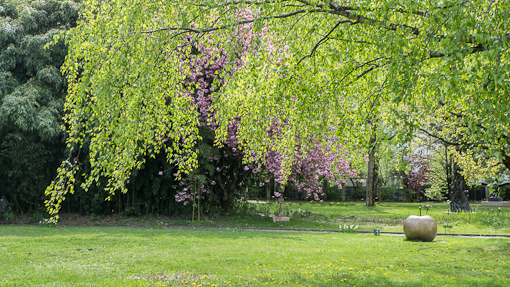 Spring has finally arrived, late but most welcomed. 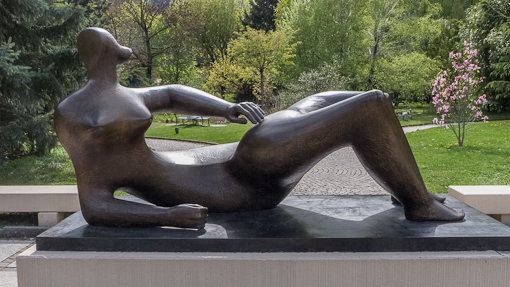 I made this trip to the Fondation Pieere Gianadda last year at about the same time. 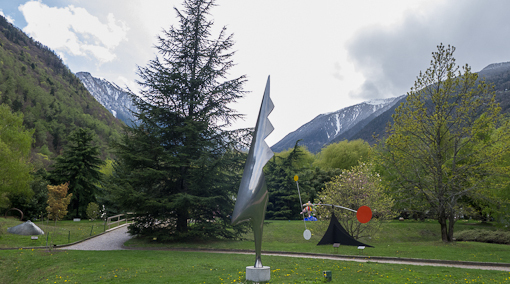 Fondation Pierre Gianadda is a museum located in Martigny – which is about an hour by car from us, lies beneath the Alps and situated just outside the San Bernardo tunnel which connects Switzerland with Italy. 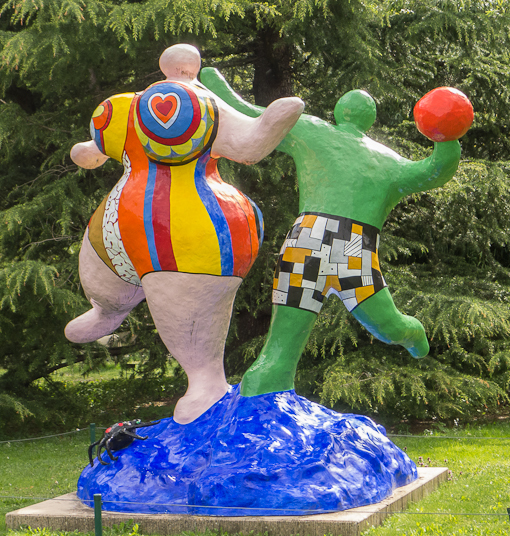 I(Chris) posted previously about their La cour de Marc Chagall. 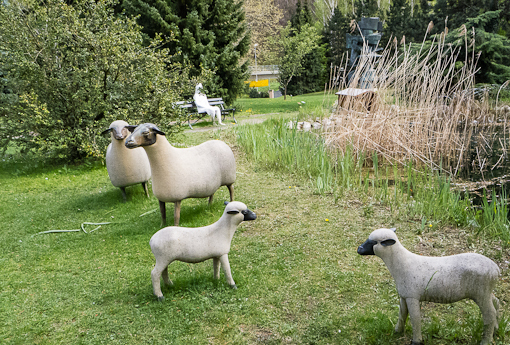 Here is the rest of the sculpture park – their official web site which has a list of the artists. 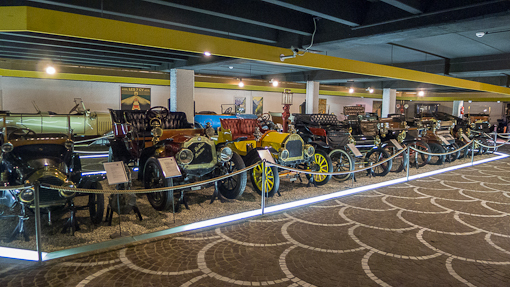 On the ground of the garden is another exhibition space which is dedicated the inventions of Leonardo da Vinci. 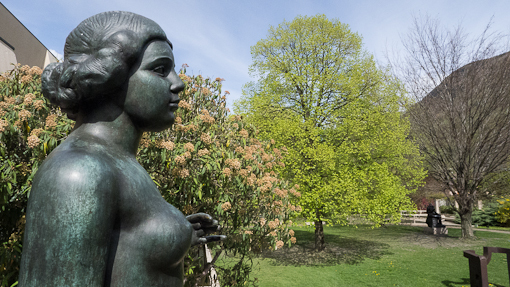 I visited in late April 2012 in the midst of Spring – so every plant was freshly green. The place probably looks rather different in winter with snow cover. There is not much for me to say, other than to come visit and see the real thing up close and personal. 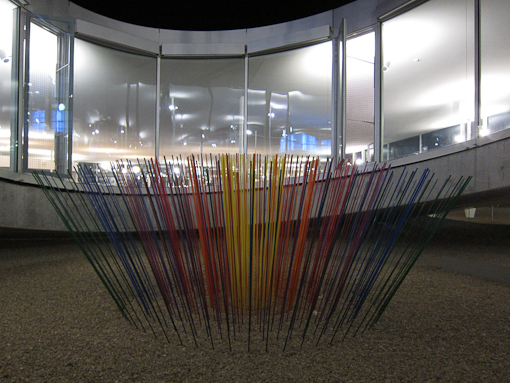 Many of the pieces are quite large and one can touch them. 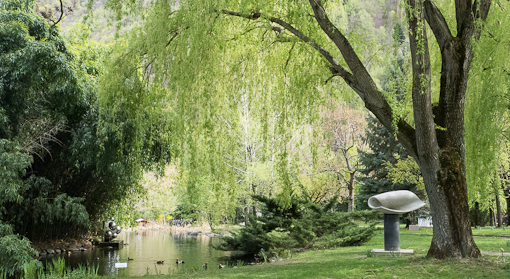 The sculptures and the location of the garden in the mountain reminded me of the Hakone Open Air Museum in Japan. It was a very nice place to spend an afternoon. 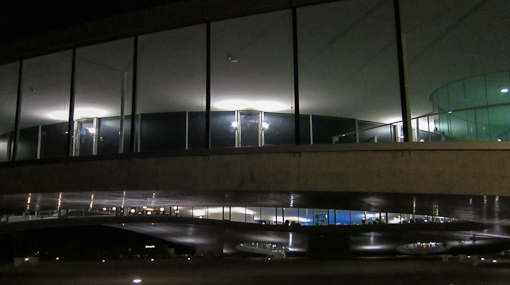 Continuing with our nocturnal exploration of the Rolex Learning Center at EPFL, one of our local universities … (part 1 is here). 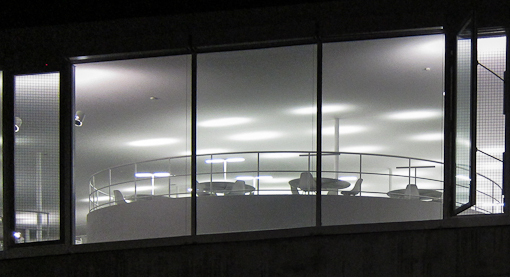 Even though it was nearly 10pm, the place was still open and there were a few students studying inside. 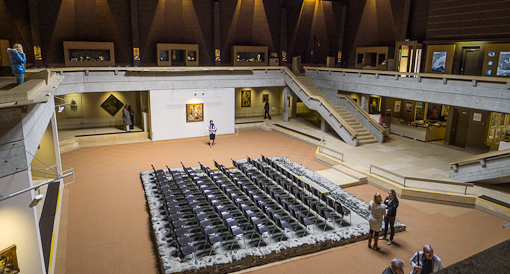 Standing in the middle of one of those open circular space, one can have a 360-degree view of who is in the building. We wandered into the campus, walked around underneath the ribbon-like structure, and even entered one of them. 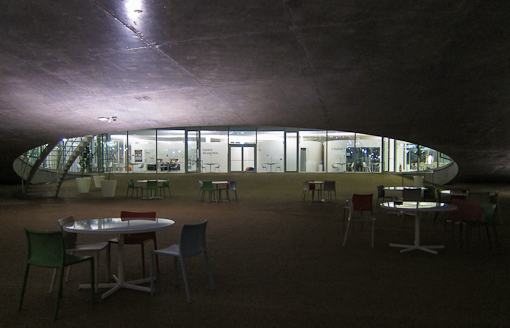 The Rolex Learning Center is a large one room space. Five external patios, intimate court- yards are sympathetically landscaped with informal seating, providing outdoor relaxation areas for visitors and students. 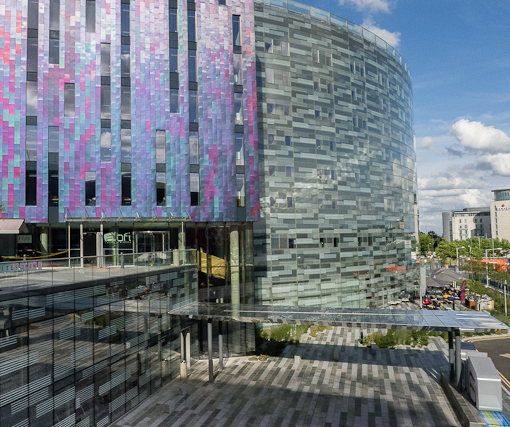 … The floor undulations and curved patios not only softly divide the different programs but also connect in a gradual and calm manner. 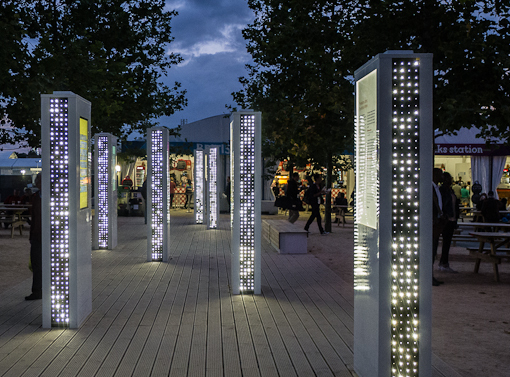 … Spread over one single fluid space of 20,000 sq meters, it provides a seamless network of services, libraries, information gathering, social spaces, spaces to study, restaurants, cafes and beautiful outdoor spaces. 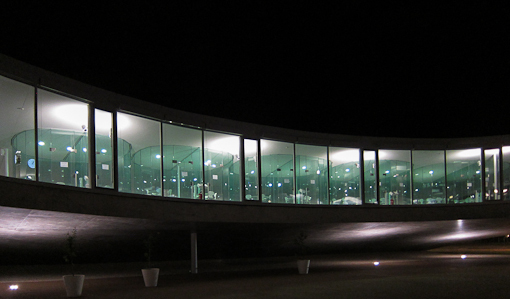 It is a highly innovative building, with gentle slopes and terraces, undulating around a series of internal „patios‟, with almost invisible supports for its complex curving roof, which required completely new methods of construction. 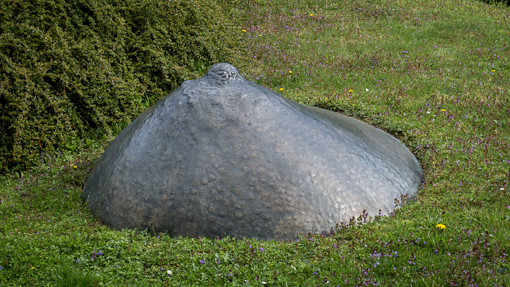 The undulating structure looked like a landed spaceship – Close Encounter of the Third Kind-like, or it is a bioweapon research center. The light and the glass walls gave everything inside a whitish green, eerie Sci-Fi look – that’s the impression we had that night. 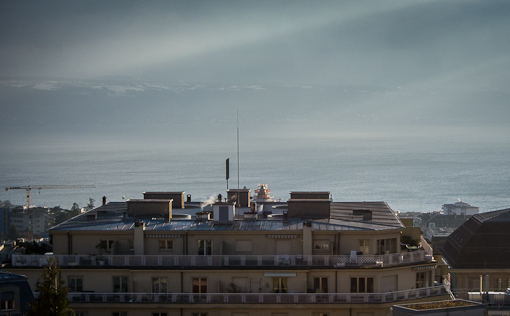 One of the major engineering issue that had to be resolved was the issue of building “perforated shells” – which gave the Swiss cheese appearance of the building (aerial view which I cannot provide, but see the official video below). 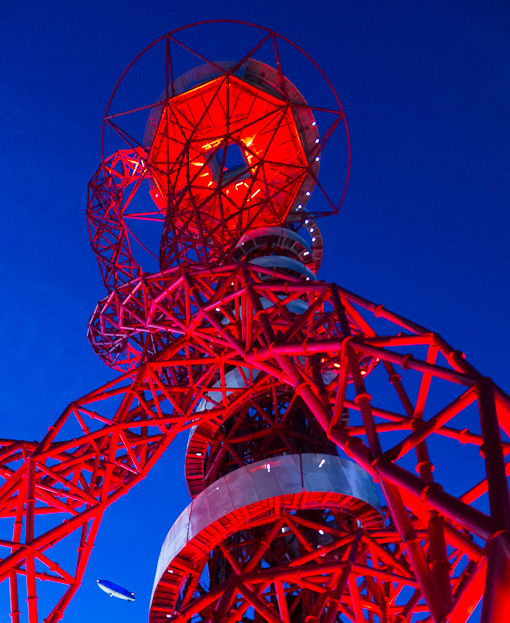 Due to its unconventional form, the actual construction is an entire story of its own. In the beginning, one rhetoric question that was asked about investing into such a building was that, given the efficiency of electronic information distribution, why should students physically come to a building to retrieve those information – why build a library ? 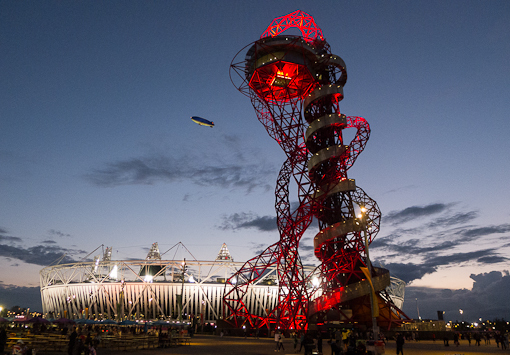 The building has been called many things during its construction: the pancake, the slice of cheese, the gadget, the layered cake of difficulties, the bad example and the Rolling Center. I suppose it can be a really good space for skateboarding too. I will return to look at the building and see how it is being used, now that almost three years have passed since its opening. This is the official video. To read more, here is a link to an article by the New York Times about the building. 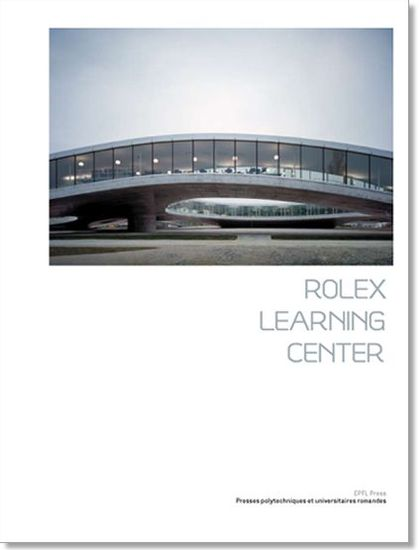 When writing this in 2013, I was aided by a book “Rolex Learning Center” published by EPFL press (whose office is inside the building), a gift from a professor at EPFL. This hard back book appears to be out of print now. But an English guide is apparently in print. We should have posted these videos and pictures two and a half years ago ! But this adventure is worth the wait. One summer night in 2010, while IT was visiting, we had dinner in Morges. And on our way back to Lausanne, we avoided the highway and used local roads which pass the campus of École Polytechnique Fédérale de Lausanne (EPFL) located at the edge of the city. We saw this brightly-lid, strange-looking structure and made this drive-by video. We were curious and decided to explore the campus without knowing what it was. IT and I sneaked around to take these pictures, while Sue waited in the car with the engine running. 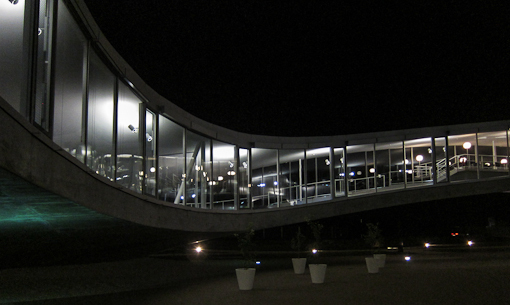 It turned out to be the Rolex Learning Center designed by SANAA, two japanese architects – Kazuyo Sejima and Ryue Nishizawa. With this building, they won the 2010 Pritzker prize (five weeks after the building opened), the world’s top prize in architecture! 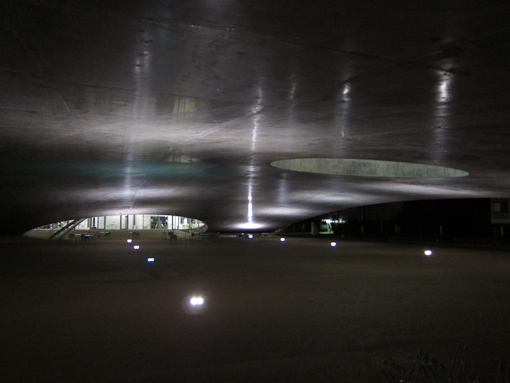 A vibrating sail during the day and a magic lantern at night, the Rolex Learning Center, as imagined by the Japanese architects, possesses these singular qualities that with Sobriety and subtlety, transcend the need foe functionality in order to touch the mind and soul – binding a community together with the art of living collectively. SANAA beat eleven other firms to win the competition in 2004. 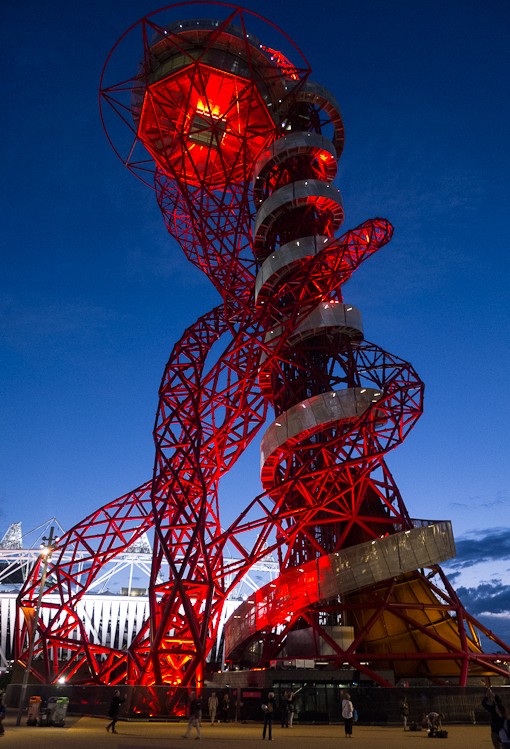 The other firms, some with star architects included Herzog & de Meuron, Zaha Hadid, Didier Scofidio + Renfro, Jean Nouvel, and Rem Koolhaas/OMA. SANAA also built the New Museum on Bowery in NYC in 2007 which I very much admired (in fact more so then the contents on display at the time of my visit). 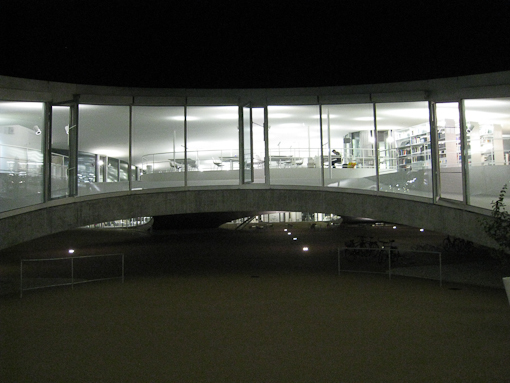 The Rolex Learning Center is a traditional library, an electronic library, a network of stimulating spaces (including an auditorium), a bookstore, a career center, a lab for learning technologies, a student association, a bank, and the university publishing house. 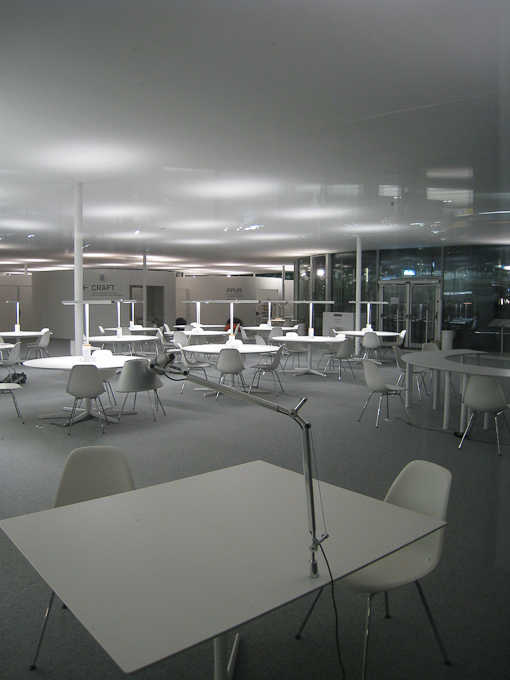 The internal spatial experience was unique as it has no walls to separate the reading area, the cafe, etc. 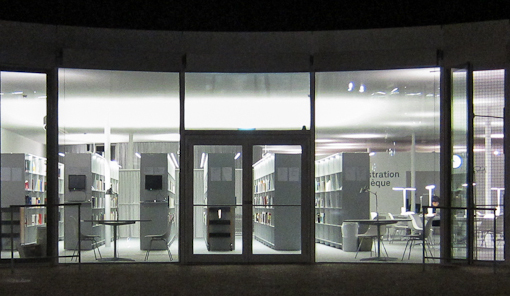 yet it has identifiable zones for the users to linger, encounter and study. There were no stories and yet the floor rises and falls in this one-room space. We did not know at the time that the building is open to the public. 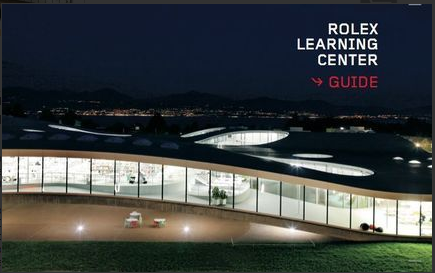 The official website of the center is at: http://www.rolexlearningcenter.ch/. After all, we did not trespass. The building was named after (I presume) the company who donated the most money. 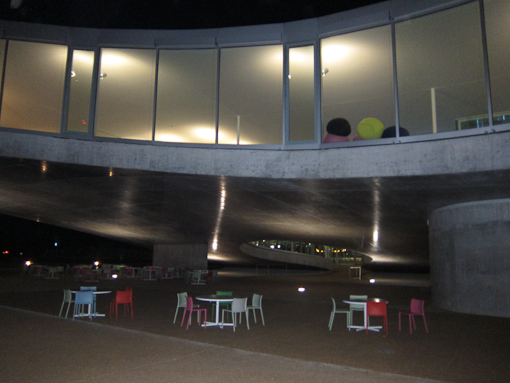 The Rolex Learning Center was opened in May 2010 to much fanfare in the local press. 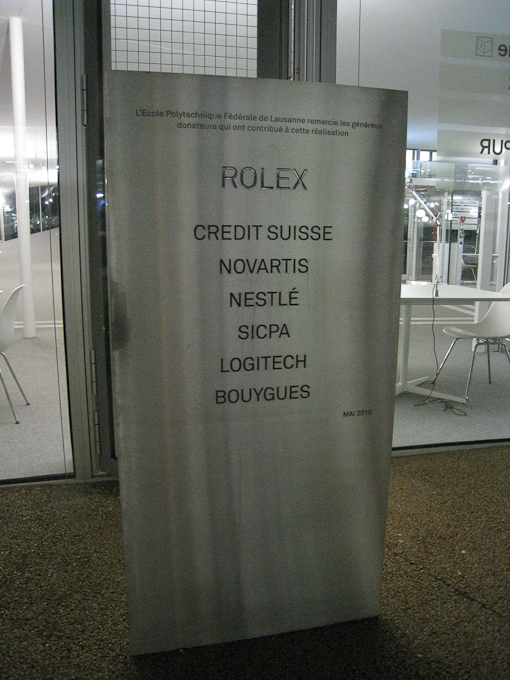 Apparently, some members of the Rolex management are EPFL alumni. 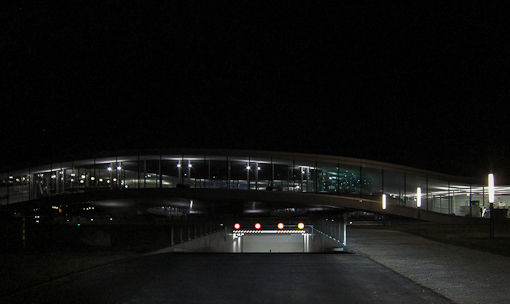 Last year (2012), Nestle opened a new research center in the same EPFL campus. I have to return to look around this building and take a look at the new one on campus (who built it ? what does it look like ?). 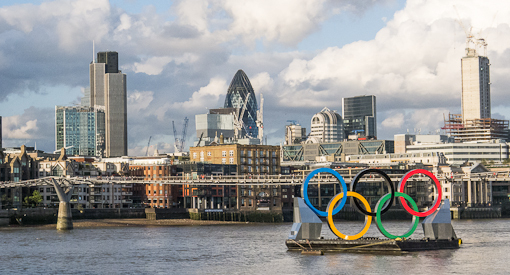 In case you are wondering, the other lesser-known sponsors – SIPCA is a maker of security ink for printing bank notes and Bouygues is the construction company involved in building the Rolex Learning Center. 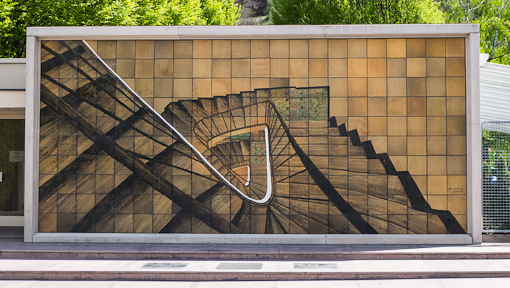 The adventure continues with more videos, pictures, and architecture lore in part 2. We had lunch at this local hotel restaurant in autumn last year. 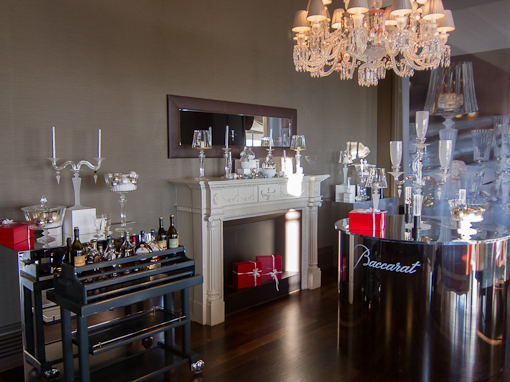 It is one of several restaurants in the Lausanne area that has been awarded at least one Michelin star. The chef M. Edgard Bovier was very friendly and came out of the kitchen to chat with the patrons, including us, in French and English. We had the three-courses set lunch (at least one other option is available per course) and it was good. 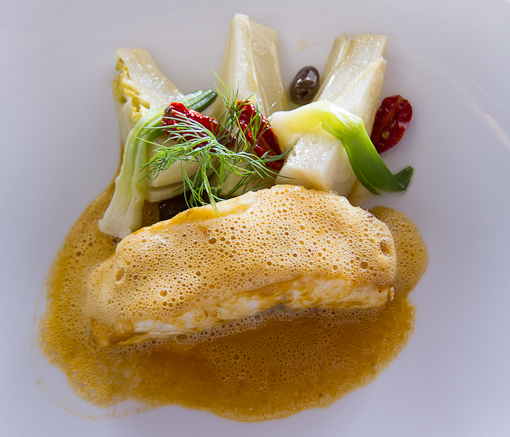 Sue had the Loup de mer with the scent of bouillabaise, fennel heart fondant and tomato confit (pardon our translation of the menu into English). 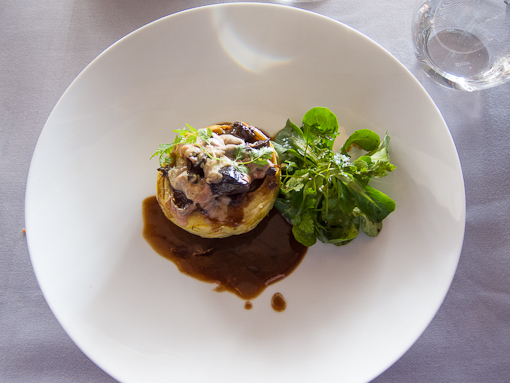 I had the oven-cooked lamb shoulder, grilled aubergine and condiments Sicilien. The dessert looked very attractive when the sun filled the dining room with light. 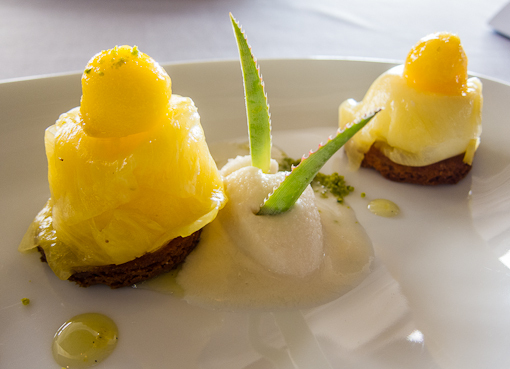 The dessert consisted of pineapple ravioli, white cheese with lime, sable breton and pina colada sorbet. Decorated by mini aloe (with pink spikes). 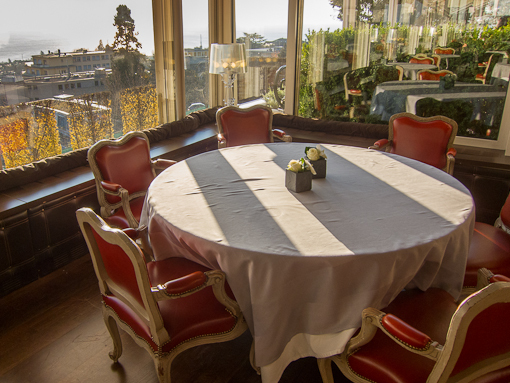 Half the dining room has a view of Lac Leman just down the hill – it was too foggy to see the lake and the Alps in this photo. The sun was coming in and out. This restaurant is recommendable. Here’s their website. We would return for dinner one of these evenings. 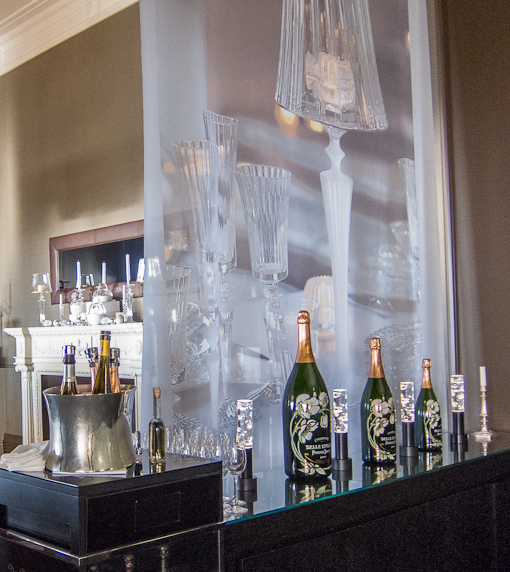 The other Michelin-star restaurant we visited a while back was Ann-Sophie Pic’s restaurant in the Hotel Beau Rivage. We did not enjoy that meal and wrote about it in an earlier post here. 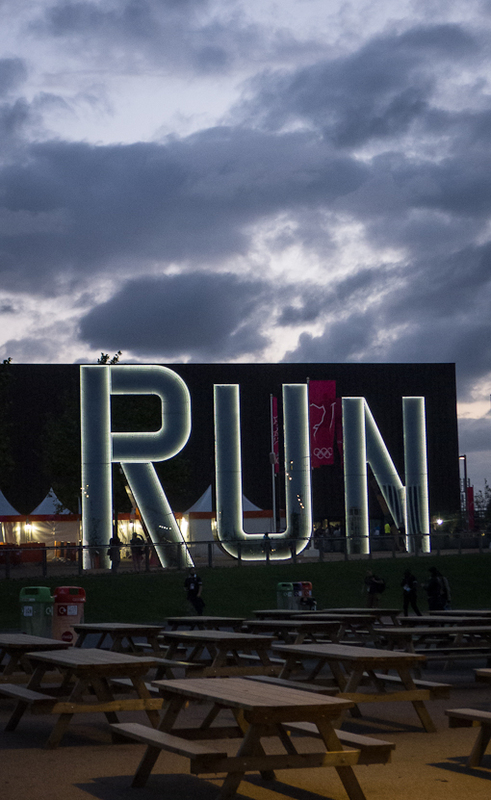 Here are some pictures of the other venues of the 2012 London Olympics located outside the main venue at Stratford. 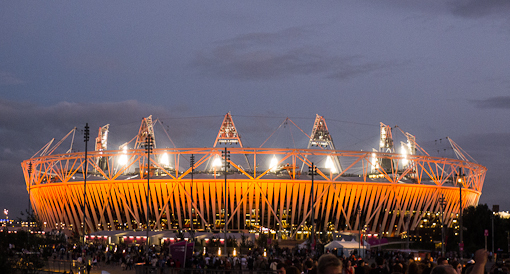 To recap briefly, we had a chance to see the 2012 summer games up close and here are our earlier posts: snapshots part 1, part 2, International Broadcast Center, badminton, diving, and track cycling. 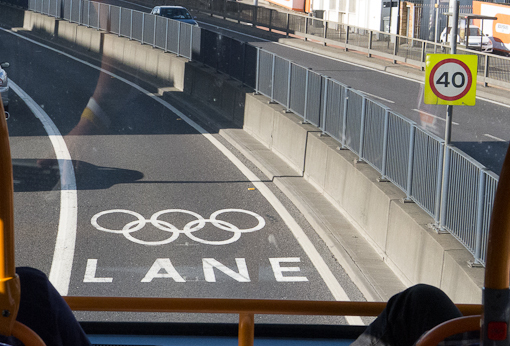 We were lucky to be able to use the official press bus to shuttle between the venues around London. 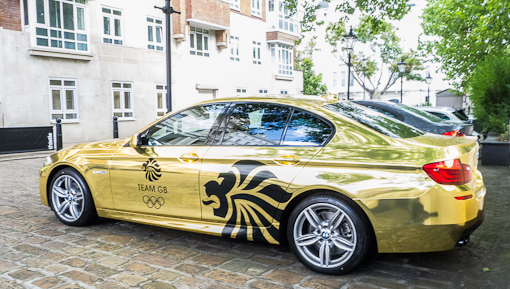 We spotted this official BMW for Team GB parked with several others at a Thistle Hotel near Bayswater on the edge of Hyde Park. Someone important was staying there. 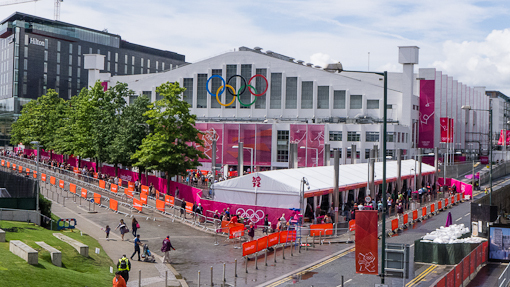 Wembley Arena – where we saw the badminton games. 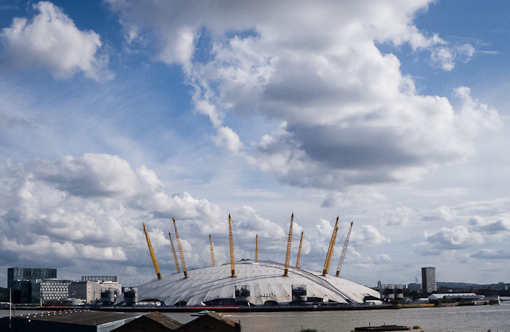 North Greenwich Arena – taken from somewhere near the Blackwall Tunnel on the official press bus which was a double decker. We had a good vantage point. 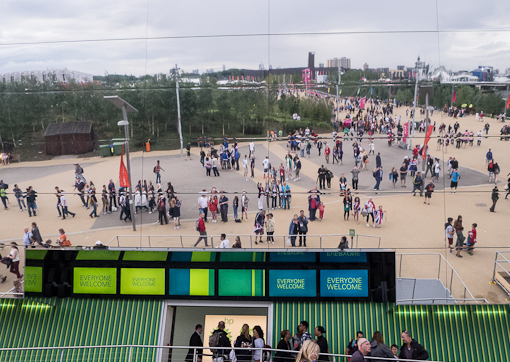 Near the entrance to the North Greenwich Arena. ExCel Halls from Connaught Bridge. 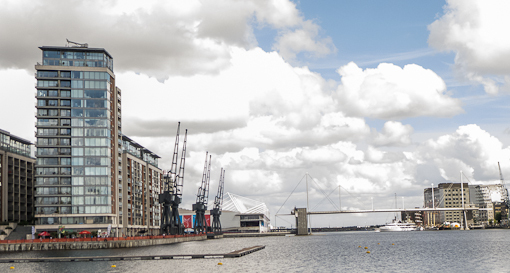 The back of the ExCel Halls from near the Emirates Royal Docks. North end of the ExCel Center. A hotel located next to the ExCel Center. 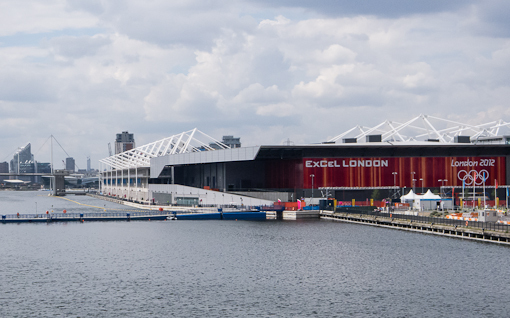 Aquatics Center – this building is actually inside the main venue. This is the athlete’s village condos which are being converted into residential units. 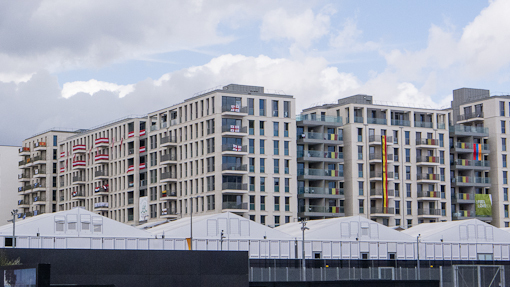 The press had no access to the village during the games – notice the flags on the balconies. 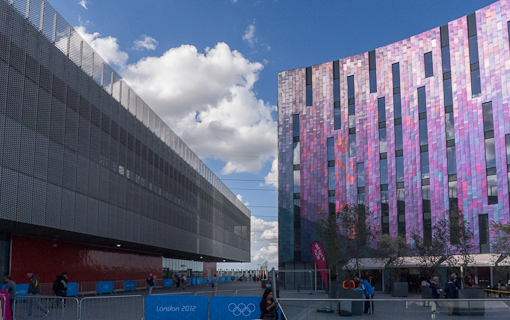 A giant tilted mirror that was mounted on a building inviting visitors to snap a picture of themselves in the Olympics games main venue. Can you spot us ? 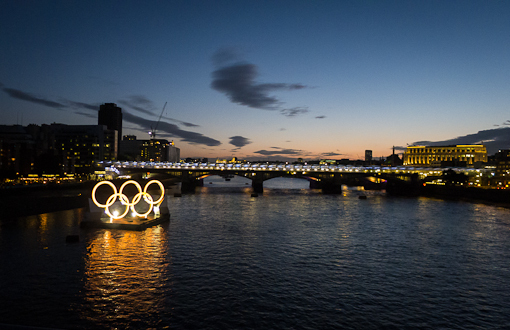 Just found a bunch of pictures taken during the 2012 London Olympics that are intended to be posted. 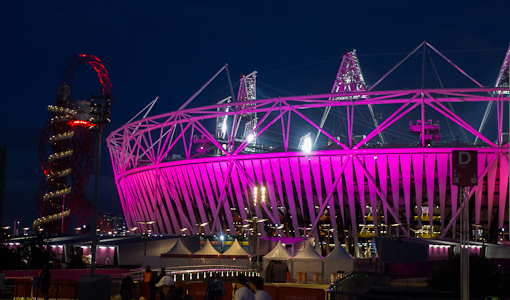 In our initial post of Olympics snapshots last year (it’s here), we focused on the events we saw. Here, the focus is on the venues. What’s the name of this thing ? It was massive. Noticed the airship ? We did not bother to get to the top but it must have a very good view of the stadium next to it. 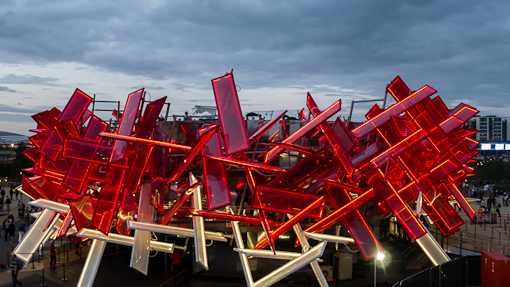 The other (more horizontal) big red object on the main venue was this installation by Coca-Cola. 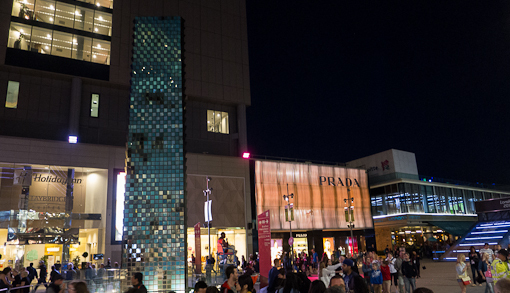 Shops just outside the main venue – Prada, etc. 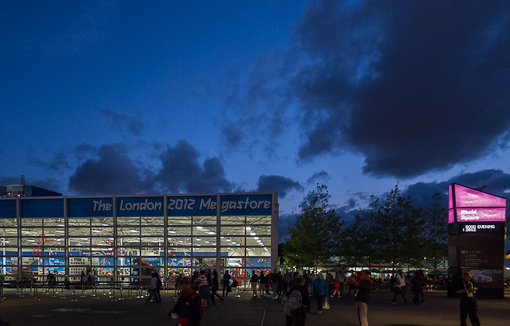 The Megastore inside the main venue. It can change its color. 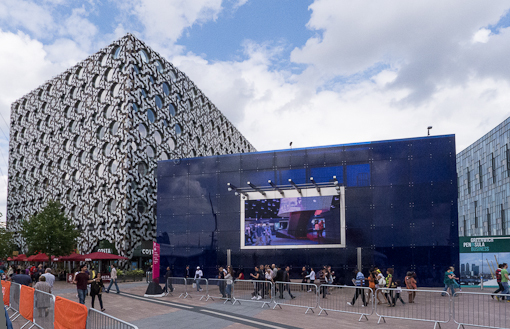 More photos of the other venues in part 3 to come. While we were visiting the International Broadcast Center of the 2012 London Olympics (see post here), we wandered into a post office/shop which sold stamps and related souvenirs (essentially mugs and posters with the stamp’s design and some special coins) to the reporters and broadcasting crew. The collection of stamps was a well-regarded hobby back in my young days. It still is except that it has probably become a niche hobby. The hobby is known as “Philately” – There used to be stores dedicated to selling new and used stamps as well as first day covers and dictionary-like catalogs. Now, they are much harder to find. This is how the postal authorities of India describe stamp collecting. 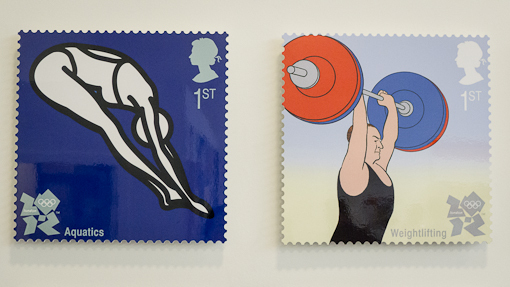 Philately is a delightful hobby that sharpens and satisfies your aesthetic tastes. While expanding your knowledge of and interaction with the world you live in, you get to know interesting details of politics, history, prominent personalities, national and international events, geography, flora and fauna, agriculture, science, monuments, soldiers, warriors, scientists, arms and ammunition, modes of transport etc. This process of learning becomes more delightful through visuals and brief write-ups. In addition, philately cultivates a meticulous and focused attention to detail. It also helps you to make friends across boundaries and age limits. This is how the American Philatelic Society explains why people collect stamps. Most individuals collect for relaxation and enjoyment although many secretly hope that they will discover a rare and elusive stamp that will make them wealthy. Some individuals collect as an investment. 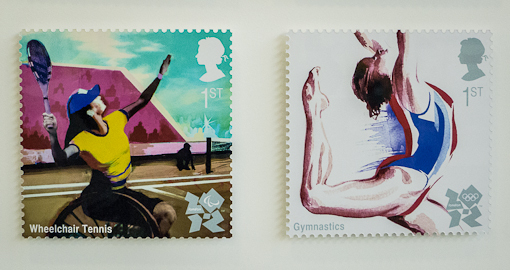 A whole sheet of stamps which presumably included the entire Olympic series was on sale. I(Chris) am not collecting anymore but I took these close ups of the stamps on display wondering how they will turn out. Not bad except some reflection. With the advent of self-adhesive stamps followed by the emergence of services like AOL and FedEx, fewer stamps are in circulation. Soon, they will be produced more or less as commemorative souvenirs and bought by collectors only. The US postal service recently announced that they are eliminating Saturday delivery – so even the institutions that produce them are under threat. One aspect of stamp collecting that I did not appreciate until I was older was the great diversity and high quality of graphics that appear on stamps. A stamp’s design was likely reflective of the style prevalent in a country at the time when it was released. 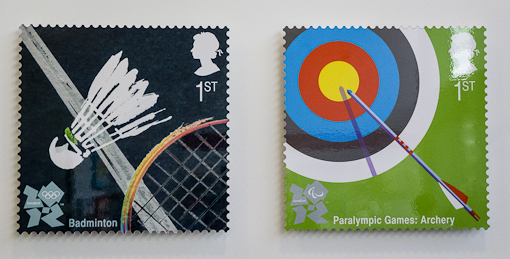 Each stamp is a mini work of art. With a stamp collection that spans a period of time, say 1940-1990’s, it may be possible to catch a glimpse of the international, historical development of modern graphics design. Because my dad was in the import/export business, I was spoiled by a constant supply of stamps from far-flung places. I was proud that they were not pristine because they were collected, in opposed to being bought new from a store. I don’t care much about mint stamps. Note that the images posted on screen here are about 2X the size of the actual stamp. The details of the image and design which are not always easy to observe have been magnified. Every stamp tells a story. If I have time, I might scan some of my stamps so that they can be viewed anytime anywhere under optimum illumination, and be uploaded here for all to see.